In a house filled with golden oak, it can be a challenge to update things in a way that is both stylish and doesn’t cost a ridiculous amount. This is especially true when it comes to cabinets in the kitchen. After all, most people are thinking ‘if I’m going to spend so much money to make this oak work, I’m going to just wait to completely renovate the kitchen.’ There is little point to investing in stone counter tops, new flooring and the rest of it, if you are just biding your time until you can deal with the cabinets. But, what can you do that will update the oak and make your kitchen look amazing in the meantime? I hear it all the time. You might be wondering, too: ‘is there such a thing as a quick, simple and cheap update for an oak kitchen?’ My answer? Yes! There are a few ways you can make it work. Right now. For little money. All of them check those boxes and can be done, by you, in a few hours or afternoons. My go-to steps: Paint the walls, change out the lighting fixtures, work with the other colors in the room (art, accessories, rugs) … and one of the biggest impacts: change the hardware! Hardware makes an enormous difference in the bones of the cabinetry and the style of the room. If I was facing down an oak kitchen that I wanted to live with, in harmony, for a bit of time, here’s what I would do in one weekend: Paint it a great color. Clear the counters. Lay down a great, eye-catching rug. Change out the hardware. Add some color (probably a big framed print and a huge plant in a nice planter). That’s it. Rest easy, friends, you can do this, too. And then, since it looks much better and you are thrilled and at peace with it, you can move on to dreaming about that full kitchen reno you are still working towards… one day. Or, maybe you will be so happy with the small changes you made that you can cross that idea right off the list and move on to dreaming about making other areas of your home just right. Wondering if the hardware on your oak cabinets is outdated? Stick to either historic (think luxurious historic mansions or Frank Lloyd Wright) or modern with simple lines. Respect the integrity and style of your home’s architecture. Balance the oak with a more updated style when choosing hardware, colors, counters, sink & faucet, appliances and accessories. Contrasting colors will make the new hardware stand out and give some visual breaks in the monotony of overwhelming golden oak (and add The Power of Distraction!) so go for black, oil-rubbed bronze or a nice silver finish. 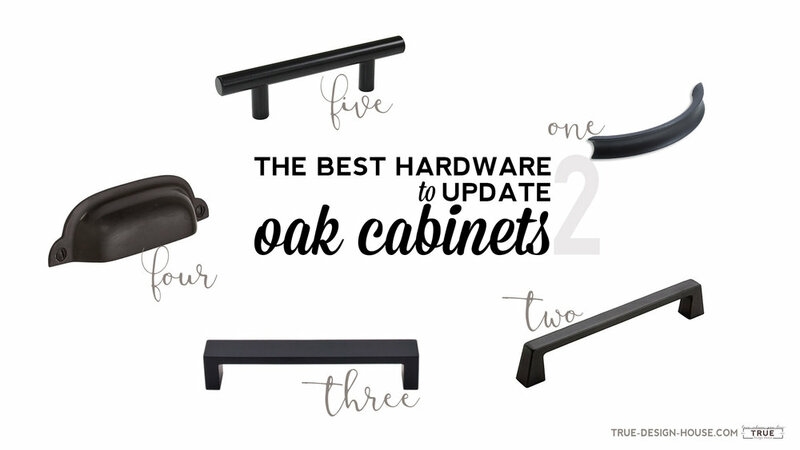 Take a look at my list of top 20 suggestions for updating oak cabinets with fresh hardware! When you are not ready, willing or able to do a complete renovation of your oak kitchen, the next best thing to do is transform it with pure style. Yes, it can look absolutely amazing! If you can paint the walls, add a rug or two and accessorize until your heart explodes, your kitchen can go from 'Sad & Outdated' to 'Pinterest Stunner' in a weekend! Clear away all the clutter, banish accessories that are too beige or orange, and give yourself a clean slate. Choose one or two accent colors and choose accessories in several shades of that color. In the example below, I went with a rich turquoise. Blues and greens are great shades to work with honey oak as they both neutralize the orange tones in the wood really well. At the most basic form, even just adding lots of eye-catching accessories will take the focus off of the oak. Rugs are a great investment in an oak kitchen because (just a guess) the flooring tends to be dated and normally lacks the style we are aiming for. Well, really, when it comes to things like dated and yellowed linoleum flooring, it probably lacks the style that anyone in the current year is going for. If you can paint the walls, it creates a gorgeous backdrop that downplays the oak and pulls everything together. Please, please do this if you can! Have time and inclination to paint baseboards and trim, maybe even the table or other furniture? That creamy, neutral white will take things up a notch. Major bang for your buck: changing out the door and drawer hardware for a dark oil-rubbed bronze pull in a smooth look that is big enough to make a statement. This is so easy to do and makes an incredible difference in the style of your kitchen. Also firmly within the DIY category of change: updating the lighting fixtures to something sleek and stylish, something without too much detail, is a huge style-maker as well. Ready for some minor renos that you can totally tackle yourself or have done in a few days by a pro? Replacing the counter top with a deep charcoal or graphite colored laminate and adding a drop- dead gorgeous hexagon marble backsplash will transform your kitchen completely. These items are a bit more of an investment, but not out of range if you are going to be making do with your oak kitchen for a few more years. The 'wow factor' of these larger ticket items make them well worth it. They are absolute game changers for the feel of your kitchen as they take up so much visual real estate. Besides, I don't know who could say no to that hex marble tile? It's stunning! In general, I wouldn't waste your resources or precious renovation energy on replacing flooring or adding granite countertops to an oak kitchen. Why not? Well, chances are when the time comes to replace or refinish the entire kitchen cabinetry, you are going to want to change those things at that time to either coordinate with the new cabinets or because styles have changed and they will need updating. You also don't like want to get 'out of your league' when it comes to return on investment with the kitchen cabinets as-is. If you sell your home before renovating any further, sinking big bucks into major items in an outdated kitchen is just not a wise investment. I had a lot of fun putting together a look that you can actually shop! All of these items are available on Amazon which also has that great Prime shipping so you really could be starting on this project in a few days! You can do this, I believe in you! It's going to be amazing! Should You Be Painting Your Cabinets White? This week brought this fabulous question to my email inbox! We live in a bi-level with the old style kitchen and separate dining room. We want to knock out a wall and make a larger kitchen and eliminate the dining room. We are having a tough time deciding between white or dark cabinets (current ones are honey oak). Are either timeless? Also, we want to add some built in cabinets in the living room, should they be the same color as the kitchen cabinets? So, this is a very common question with a very complex answer and I’m so glad you asked it! The answer requires a bit of a design thinking in a few other areas: balance and details. When both of these areas are addressed, the cabinet finish question really becomes less of ‘which is right’ and more of ‘how can I make either of these look right’, because the truth is, either can look amazing. How can that be? Well, as I’m sure you’ve already seen in the endless research you’ve likely been doing on Houzz, Pinterest or Google Images, either dark or white cabinets can look so, so good. And, either white or dark cabinets can be timeless (more on that in a minute). 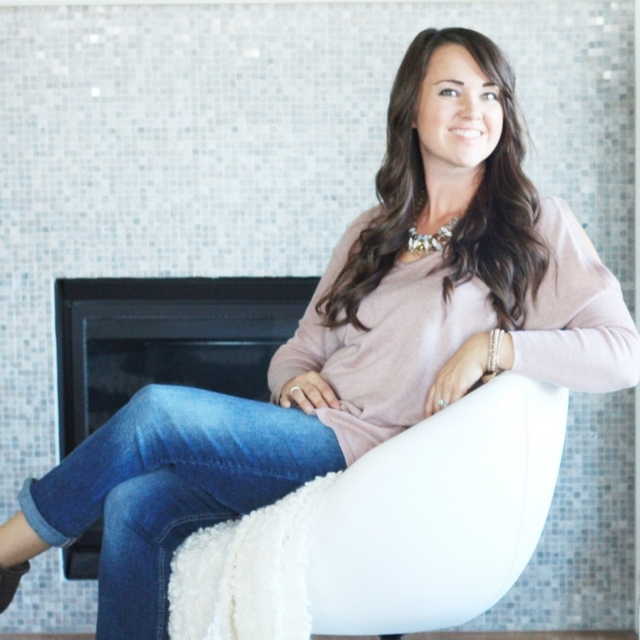 So, how do you narrow it down for your space when there seems to be no easy right answer? I’ll lead you through a few things to consider for each finish because in the end, it all comes down to whatever is the most appealing to you, what makes you the most comfortable. There is no right answer because both are right. White cabinets have a clean, airy, fresh feel. They open up a space visually and make a room feel much bigger and brighter. There are so many shades of white cabinets right now and so many detailed finishes that can all really change the look (from stark white to warm antique white, from a solid finish to a gel stain glazed into the corners). White cabinetry is not always just plain white. White tends to give you so much more flexibility with the other finishes in the space – you have practically no limit to the flooring, backsplash and wall options, when it comes to either color or pattern. This is a huge, huge advantage over trying to work with a wood tone. Yes, lighter cabinets show dirt and dust build up faster than darker finishes. I would argue, however that in sunlight, dark cabinets often show build up more while adding on much more visible water marks from wiping cabinets. Besides, sometimes knowing when your cabinets need a wipe and being able to have them actually look clean when you do it is a nice thing. Dark cabinets have a rich, warm, solid, inviting feel. They can make a space feel cozy and luxurious. In a mainly-winter climate (hello Northern Hemisphere people), it’s important to remember that sunlight bouncing off snow is very blue or grey. It makes all other colors look bluish or greyish – imagine wearing faintly blue-tinted glasses and looking around your room. To counter this, a warm toned room feels really good. No soul on a snow-covered tundra in February wants their home to feel more icy and cold. There are a lot of shades of dark wood stains available – from warmer reddish browns to stark, almost grey-black tones, so it’s possible to get a variety of looks in darker wood. Having said that, it can be difficult to match or coordinate the wood tone of the cabinets with other wood tones in the house, either more permanent elements (flooring, baseboards, doors) or the more flexible items (furniture, accessories). This is the classic problem with a kitchen renovation where you don’t have (or want to create) a blank slate in the rest of the house. Cabinets can be stained with a rub-in semi-transparent stain which shows the grain or sprayed with a solid stain – both have very different looks, so there are a lot of options here as well. A wood tone with visible grain adds a visual texture to the room – this can be a great natural element but it can also make it difficult to choose other finishes for the space, especially a patterned backsplash that can often compete visually and make things very ‘loud’. A kitchen with dark cabinets really looks best balanced with a lot of light – rooms with large windows are a prime candidate for gorgeous dark cabinets but even rooms with little natural light can look beautiful with carefully considered lighting (LED pot lights, lots of bright and airy pendants over an island, an oversized fixture hanging over the table). Darker cabinets tend to have more visible sheen due to their finish and this can make people crazy trying to wipe off drips and smudges, and then polishing those wet cloth marks away. Even though the general impression out there is that dark cabinets are easier to keep clean, dark finishes do show dust and smudges just as much as lighter cabinets with the added bonus of also showing water marks when they are wiped clean. Is it possible to keep dark cabinets gorgeous, though? Of course and for many people it’s worth it. As you can see, there are benefits and challenges to either scenario and what I always end up recommending to my clients is that in the end, you just have to go with what you love and work out the details surrounding it. Chances are, there is a dream kitchen in your mind and it has a certain look to it that you are in love with. More often than not, it’s a look you return to over and over. Maybe you are trying to convince yourself that something else is a better fit – I wouldn’t go down that road. Go with what you know you love and it will be something you love. Once you’ve chosen a cabinet finish you need to balance it out. What does that mean? Well, whatever you do with that big, huge, dominating presence in your room (the cabinets), you are going to want to do the opposite for a lot of the other elements in the space. If you are going with dark cabinets, you are going to want to make sure you have lots of lighter elements in your room. These can be things like actual light (windows and light fixtures), lighter and brighter ‘permanent’ elements (backsplash, countertop, flooring, appliances) and visually lighter accessories (big, airy art pieces, a huge mirror, creamy white throws, a large light colored centerpiece on the table, lighter throw rugs, white furniture, etc). If you choose to go with white cabinets, you are going to want to balance things out with some darker elements to ground your space, warm it up and keep it from looking like a white cave or sterile operating room. In this case, you would take that list above and consider those things in some nice dark, rich tones. One last thing that really pulls together the look and feel of a space – it’s all framed by those details. Regardless of the color or tone of your cabinetry, it's the style of the doors, the type of hardware, the light fixtures, the accessories, the art and the furniture that give a room it’s polish and it’s mood. I’ve seen black cabinets that are at home in a rustic country kitchen and pure white cabinetry that is right at home in an ultra modern kitchen. Take a close look at those small elements in some of the kitchen photos that you love – I bet you will find that many of them share a similar style. And finally, to answer your question about matching cabinets and built-ins – this is something that can also go either way. On one hand, if the flooring is the same throughout both spaces, I feel like giving the kitchen some division by having a different color works well. The living room doesn’t want or need to feel like a part of the kitchen. On the other hand, if you have different flooring in both rooms, another color for the trim, and possibly even more wood tones in the doors, furniture and bathroom cabinetry, it can add some cohesiveness to maintain the same cabinetry throughout a house. I would aim to pull things together if they need it (keep it the same) or give some definition to the spaces if they don’t (do two different finishes). In hot pursuit of a timeless look, white kitchens are very popular right now. Rightly so, they are beautiful – clean, open, bright yet warm. I am a huge fan. However, there is more than white cabinetry to creating a classic kitchen, one that won’t soon need to be renovated to retain its dignity. Here are 5 things to consider when thinking about white for your kitchen – I hope they help you through your own process! 1. The color white is a classic color for kitchen cabinetry. Over every style in every decade, there have been beautiful, popular white kitchens. White cabinets are very versatile and can be updated so much easier than a wood tone that is forever married to a decade (I will just whisper ‘honey oak, brass and dusty rose’ in your ear and you will go to a place you quickly want to return from). 3. Add in some contrasting neutrals to make those cabinets stand out (flooring, rug, furniture) and layers of textures (tile pattern, window treatments, soft seating fabrics, centerpieces, accessories) and things are filling up beautifully. 4. It’s also really important to think about the architecture and era of your home, especially if your home is historic and something you are going to be preserving. Completing a kitchen that flows with the architectural details of the rest of the house is a beautiful and lasting thing. 5. As for the things that are easy to replace or that are going to need to be replaced eventually anyway? Go with what you love and don’t worry too much about it! Paint color, appliances, pendant lighting over the island, even that faucet you are crazy about. It’s not going to last 100 years anyway, right? Here’s where to go all in. So, does this mean that using white cabinetry will naturally create a timeless look? I wish it was the entire answer, but it’s not. Remember, it’s the details of a kitchen that will fade from fashion eventually and show its true age: the style of cabinets, the hardware, the backsplash tile, the sink and faucet, the appliances. This is a Photoshop project I did for a client considering making the move to warm antique white cabinets. What do you think? If you go with neutral and simple for the big things and go with the loud things you are absolutely mad about for the small stuff, you can’t go wrong!